Hey, wouldn’t it be great if you could print graphics that have the same look as a decal cut from metallic vinyl? Or if you could print rich, opaque color on clear static cling window decals? Well yes it is. I didn’t say ‘yes it would be‘ because it already be. I mean it already is. What is it? It’s a revolutionary new printer with an available eight-color gamut that includes white and metallic ink. It can print images that look like metallic vinyl or even chrome. You can produce T-shirt transfers with the feel of premium PU film and the look of printed glitter or colored chrome. And it can add a white under-base to printed images on clear media for solid color that doesn’t wash out in backlit applications. What is it? We call it the PrismJET VJ24X white and metallic inkjet printer. X is for eXpanded gamut, eXciting new print applications, and eXtremely happy customers. As the name implies, the PrismJET VJ24X is a new version of our 24″ eco-solvent printer, the PrismJET VJ24. Where the VJ24 uses a dual CMYK ink configuration, the VJ24X adds three other options. It can also be used as a six-color printer using CMYK plus Light Cyan and Light Magenta for better pastels and gradients. Or it can be configured with seven colors consisting of CMYK plus Light Cyan (Lc), Light Magenta (Lm), and White. Or it can be configured as an eight-color printer using CMYKLcLm, White and Silver Metallic ink. The Metallic ink can be used as a silver spot color or in combination with the other inks to add a metal-flake effect to every color in the gamut. Now that we know what it is, let’s talk about why it is. The PrismJET VJ24X is here to eXpunge the limitations of CMYK printing. Process color printers can’t produce vivid color on transparent media because only a small amount of the light hitting the media reflects back through the ink. (For a more detailed explanation of this principle, please see our blog about Color Space). CMYK graphics on clear static cling or window film may look washed out, depending on the amount of light behind the window glass. The result is a loss of the visibility and effectiveness your customers want. Metallic ink takes it one step further. Instead of just adding a white layer to reflect light back through the ink, metallic ink eXcites and eXxaggerrates that reflected light by adding metal flakes that perform just like metallic automotive paint or metallic vinyl. This adds a sparkle to your prints that can be managed for effects ranging from subtle to bold. How does this eXtraordinary new PrismJET work? It’s not just the added ink cartridges. The precise placement of white and metallic ink is managed through the use of the RIP software and a new MUTOH Metallic spot color library. To add spot colors to a design, say a chrome effect for a phone number, you designate a specific metallic spot color as the fill for that element in your design. This can be created in LXI Master Plus, FlexiSign, CorelDRAW, or Adobe Illustrator. The job can then be sent to the Flexi Production manager using the Rip and Print function or added to Production Manager as an .eps file. The spot colors are mapped to the RIP. Special profiles and presets for metallic ink translate your design into metallic magic. Fig 1. Metallic ink under process color can produce brilliant chrome effects when printed on glossy vinyl. To help you manage that range from subtle to bold, there are layering options. To give an entire print a subtle metallic luster or chrome effect (Fig1), add the metallic silver layer beneath the CMYKLcLm ink layer. The same setting can look like metallic vinyl or chrome depending on whether it’s printed on matte or glossy vinyl. To add an intense spot color, use the spot color setting. Silver metallic ink printed on top of the CMYKLcLm ink , but only in the area where the spot color fill was placed in the design. 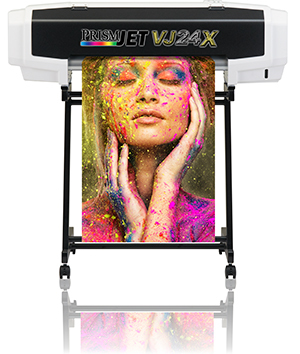 With the 474 spot colors in the Mutoh Metallic library and 8 different White and Metallic layer and spot color options, you might say the PrismJET VJ24X is eXtremely FleXible. With any new print methodology, there are tradeoffs: pluses and minuses. We’ve covered most of the eXciting benefits of the new PrismJET VJ24X eight color option. Are there any downsides? Just a few. • Cost: White and metallic inks cost more, so you won’t want to use them on every job unless your customers are willing to pay more. It may be best to present it as an extra-cost option for your more discerning customers. • Speed: Switching from a dual CMYK ink set to an eight color gamut reduces print speed, so you can’t crank out prints at 400sf/hour in eight-color mode. Think of it as quality over quantity. • Conversion: Speaking of modes, there are 4 possible ink configurations: Dual CMYK, CMYKLcLm, CMYKLcLmWW, and CMYKLcLmWMt. It is possible to switch from one to another, but only once. If you choose the 7-color configuration, you can replace a white channel with Metallic to go from seven to 8 colors. But you can’t switch back to seven colors. Nor can you switch to dual CMYK to crank out some fast prints and then reload white or metallic ink. If you want to regularly alternate between dazzling quality and blinding speed, get yourself a PrismJET VJ24 for high-volume production, and use the VJ24X for premium printing. • Maintenance: Like all PrismJET products, the VJ24X is engineered by MUTOH. That means it has built-in solutions that prevent problems that plague other white-ink printers. The VJ24X has an internal ink recirculation system that keeps the metallic and white ink lines flowing to prevent clogged nozzles. Just keep the printer turned on and its eXpert engineering will keep the internal ink delivery system running smoothly. To keep the cartridges in the same condition, you do have to remove and agitate them daily. It takes all of about 60 seconds. If you forget, the bundled VSM software will remind you. • Size: It’s only 24″ wide. The PrismJET VJ24X is perfect for T-Shirt transfers, custom vehicle graphics, window signage and a host of other eXciting applications. But it’s too small for vehicle, boat and building wraps. If you want the same benefits in a jumbo size, may we interest you in a MUTOH ValueJet VJ1628X? It’s 64 inches of eXtra-wide, eXpanded color eXcellence, starting under $20,000. Speaking of cost; considering all the eXtra utility it provides, the PrismJET VJ24X is a great value. The 8-Color ValuPRINT package, which includes the FlexiPRINT DX RIP, CMYKLcLmWMT ink starter kit, and one year on-site warranty is yours for only $8,495.00. Or about $199/month* if you choose to lease one and let it pay for itself. If you prefer the eXquisite pastels and gradients of the CMYKLcLm version and don’t need white or metallic ink, your 6- color ValuPRINT package is only $7,795.00 or $180.00/ month. * We make leasing your PrismJET fast and easy. With good credit, you can apply online and get approved in less than 24 hours. Click here to get the ball rolling. So if your shop needs some clear window stickers with color that pops, or T-shirt transfers that delight and dazzle your customers, we’ve got your affordable solution. I’ll bet you thought I’d be all out of eXasperating eXpressions by now. Not quite. Let me just conclude by saying that if you’re looking for eXpanded color gamut, eXciting new print applications, and eXtremely happy customers, the amazing new PrismJET VJ24X will definitely eXceed your eXpectations. *60 month lease with approved credit.